After nearly two years away from the UFC, Conor McGregor is headed back into the Octagon on Saturday to face Khabib Nurmagomedov in what is being touted as the biggest event in UFC history. 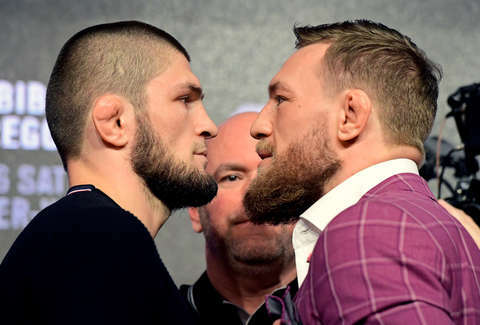 The hype for UFC 229 is big, and it's warranted: this is a grudge match for the ages, as the two have been feuding for some time (McGregor even got arrested earlier this year for throwing a dolly at Nurmagomedov's bus). This is being seen as a comeback of sorts for McGregor, the Irish two-time UFC champ, as he goes head-to-head with undefeated lightweight Russian Nurmagomedov at the sold-out event at the T-Mobile Arena in Las Vegas on Saturday, October 6 at 10pm ET. And while you may not be able to catch the action in-person, there are plenty of other ways to watch the epic throw-down live. Here's what you need to know. What time does Nurmagomedov fight McGregor? The UFC 229 will feature 12 bouts in total, starting at 7pm ET. However, the Khabib vs. McGregor fight won't start until at least three hours after that. So if you're just tuning in for the main event, expect it to happen around 10pm ET or possibly later, if the previous fights go long. If you want to tune-in early, the prelims will be streaming on UFC Fight Pass and you may also be able to catch some of the pre-fight action on the Fox Sports Go app. It's worth scoping out your local listings, too, to see if Fox Sports 1 will be running any pre-flight coverage in your area. The main event, meanwhile, will be pay-per-view, and you can order it either from your cable provider or on a number of over-the-top streaming devices like Amazon Fire TV, Apple TV, Roku, Xbox One, and more. You can also catch the ceremonial weigh-in on Friday, starting at 8pm ET here. To catch the pay-per-view action, you can expect to fork over a cool $64.99 to get it in HD (it's $54.99 for standard definition quality). But, hey, get a few pals to chip in and that's not too bad. Last year's McGregor vs. Mayweather fight cost a whopping $100. How do I order the fight? To make sure you get to watch, you can simply buy the fight from your cable provider, or purchase it through a streaming service. You can peep a list of the pay-per-view providers here. You should be able to see some of the prelims on FX, but the main event will be pay-per-view, and you'll need to order it via your cable provider or a streaming service to be able to watch. How do I livestream Khabib vs. McGregor? You can livestream some of the prelims and the main event on UFC Fight Pass (though you'll have to fork over the pay-per-view fee to watch the latter). The short answer to this is, you can't. However, you may be able to catch some of the prelims for free via the UFC Fight Pass and signing up for the free 7-Day Trial. You bet there are. To find out what local watering holes will have the fight on, you can scope out venues that have confirmed their pay-per-view purchase on the official UFC site.